Deik Vacuum Cleaner 2 in 1 Cordless Vacuum Cleaner, REVIEW * Exposed! An In-depth Review of the Deik Vacuum Cleaner 2 in 1 Cordless Vacuum Cleaner! The Deik 2 in 1 Cordless Vacuum Cleaner was designed to be an affordable alternative to the popular higher priced brand name cordless stick vacuums. Founded in 1965 Deik is headquartered in İSTANBUL, Turkey. Deik markets a line of home care products that include coffee makers, juicers, steamers, mixers, vacuum cleaners, etc. Information concerning their office address and telephone numbers is not available. Deik claims to “perform in-depth studies of lifestyles in North America and Europe to develop affordable products that meet the demands of the markets.” However, Deik has established a consistent track record of NOW honoring their warranty on this or other products. Due to the negative feedback I have received from my customers concerning the quality of this vacuum, also labeled 7Kpa in a different Amazon listing, and the unwillingness of Deik to honor their warranty I DO NOT RECOMMEND THIS PRODUCT! Read “Recommendation” below. Light-Weight at only 4.7 lbs. Take a Look at this Cool Customer VIDEO! Deik may not be a household word like those big name vacuum cleaner manufactures but the new Deik 2 in 1 Cordless Stick Vacuum Cleaner is getting plenty of attention from customers who are looking for a practical yet inexpensive Cordless Upright Vacuum. Unfortunately, many of them are discovering that the old adage “you get what you pay for” to be true when it comes to this vacuum cleaner. One of the reasons shoppers are taking a close look at the Deik Vacuum Cleaner 2 in 1 Cordless is the physical similarity to the popular Dyson V Series Cordless Uprights, Shark IONFlex DuoClean Cordless, and the Hoover BH52210PC Cruise Cordless (SEE Comparisons Below.) But the main reason for all the attention I believe is the price tag. This genre of vacuum appeals to the home keeper who wants a quick and easy solution for dealing with everyday cleaning around the house without having to drag out the heavy corded upright or canister vacuum. For maintaining your floors a cordless upright makes a lot of sense – if it will get the job done and it’s not more trouble than its worth. When it comes to reviewing cordless vacuums, the two major shortcomings I run into are not enough power or not enough runtime to get the job done between charges. 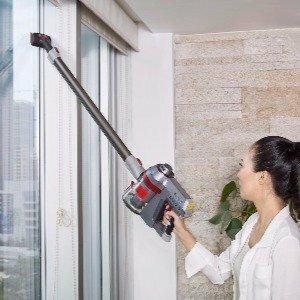 The Deik Vacuum Cleaner 2 in 1 Cordless utilizes a “high-efficiency DC Motor” that generates 7Kpa of suction although I have not been able to confirm this claim. However, like any other cordless stick vacuum, it cannot compete with a corded full-size upright when it comes to cubic feet of air per minute. That 7Kpa rating is for a relatively small vacuum nozzle, whereas a full-size upright would be approximately double the square inches. With a motorized brush roll to loosen embed dirt and pet hair there is enough suction power to remove it from low to medium pile carpet. The Deik Vacuum Cleaner 2 in 1 Cordless does a decent job cleaning carpet as long as you make several passes. 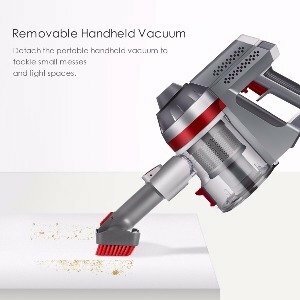 It works well for quick clean-ups of surface debris and pet hair, but, with the ability to upgrade the runtime the Deik 2 in 1 Cordless could be used as a Primary vacuum if you live in a small apartment or condo. When it comes to smooth or hardwood floors the Deik Vacuum Cleaner 2 in 1 Cordless does a good job. 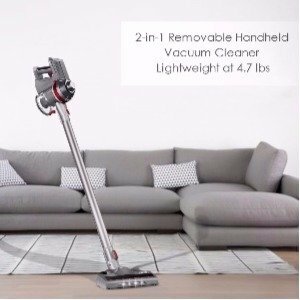 The Deik Vacuum Cleaner 2 in 1 Cordless was designed to easily Transition from low-pile carpet and area rugs to hard flooring by just pressing a button. After fully charging the 22.2V Lithium Ion Battery (which takes from 4 to 5 hours,) the first thing you will notice is how light the Deik Vacuum Cleaner 2 in 1 Cordless is at only 4.7 lbs. Despite its awkward-looking appearance, it is surprisingly well balanced making it very easy to maneuver and easy to clean overhead with one hand. By removing the motorized floor brush and attaching the crevice tool or upholstery tool you can easily clean ceiling fan blades, vents, shelves, etc. To operate the Deik Vacuum Cleaner 2 in 1 Cordless, simply pull the trigger. This locks it in the ON mode so you don’t have to keep it depressed while vacuuming. To stop simply pull the trigger again and the vacuum is switched off. In the upright mode using the motorized floor brush you can expect approx. 25 min. of runtime. Without the motorized floor brush, approx. 40 min. Or, upgrade the runtime with an optional 2nd battery. A bank of LED lights on the front of the floor brush are very helpful when vacuuming in poor lighting or after dark. In the handheld mode you can use the crevice tool for getting into narrow restricted areas. The upholstery tool has rubber bristles which work great for removing pet hair from upholstery and pet bedding. The upholstery brush works OK for carpeted stairs but not great. Cleaning stairs works best with the motorized floor brush where the carpet pile gets matted down. The quick-release Dirt Cup Capacity is .5 Liter and easy to empty. One of the issues I have with many of the cordless vacuums currently available is they lack adequate filtration. They stir up the allergy-causing particulates found in every home and cycle them back into the air you breathe. Very unhealthy! The Deik Vacuum Cleaner 2 in 1 Cordless is equipped with a HEPA-Level Filtration System that halts harmful bacteria, mold spores, and other allergens from being re-circulated back into the air in your home. The main filter can be washed and the exhaust filter should be replaced approximately every 6 months. UPDATE: I would avoid this vacuum cleaner and company like the plague! After reviewing the Deik Vacuum Cleaner 2 in 1 Cordless my initial impression was favorable. However, after numerous customer complaints my opinion has changed 360 degrees. Most complaints are not about performance, but about shoddy build quality. Customers are experiencing parts breaking under normal use and very very limited battery life with NO resolution by the manufacture. You can expect decent cleaning performance when this product is new but a high percentage of legitimate customer reviews indicate failure within the first 30 days. My suspicion is that Deik does not actually manufacture any products. I suspect that they contract with an Asian manufacture who has already built the tooling from a design they have copied from American company which has become common practice. A few minor changes in color, add cheap electrical components, and name plate and they have a product they can sell wholesale and make a nice profit. Small fly-by-night companies like Deik can market these kind of low-quality products indefinitely by deceiving customers with false claims. Then when the product eventually breaks the tactic is to stall the customer by promising resolution and putting the customer off until they go away. Update 5/23/18 It has come to my attention that there have been numerous customer complaints regarding Deik’s Customer Service. Deik has not been responding to requests for service of defective vacuums, or they have refused to follow up on promises of service. NOTICE 8/7/18 If you have purchased this vacuum cleaner and are having issues with it Contact Amazon Customer Service @ 866-216-1072 US, 877-586-3230 Canada, or 1-206-266-2992 International 24 hours per day. Explain to the associate you are having a problem with your Deik Vacuum and getting them to resolve your issue. Give them the ASIN # B07CCMNQCS. Amazon is aware of the issues customers have been having with this company and is working on removing the product. Amazon has stated that they will process a refund for this product even if the 30 day return policy limit has been exceeded. If your heart is set on a cordless stick vacuum the Deik Vacuum Cleaner 2 in 1 is about what you would expect for the price – DISAPPOINTING! It does work reasonably well while its working, but don’t be surprised if you find yourself with a $120 piece of worthless plastic after a couple months. I DO NOT Recommend this Vacuum! 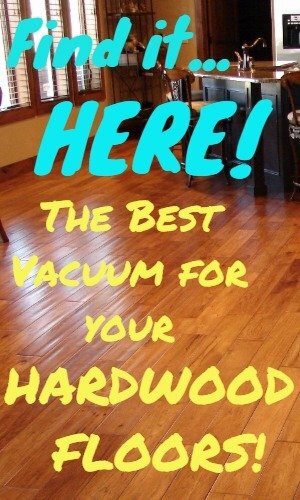 But before you decide, take a few minutes to check out my posts, Best Cordless Vacuums for Pet Hair – Complete Guide or Best Cordless Vacuums for Hardwood Floors – Guide for my top recommendations! Weight 4.7 lb. 5.5 lbs 4.7 lb. 3.8 lbs. What is the address to send the warranty card to? Hello, and congratulations on your purchase. The Deik should be a great cordless vacuum for you. Send your inquiry to support@deik.co. Deik Customer Support typically responds quickly. Good luck trying to get a hold of Customer Service. There is NO NUMBER TO CALL and they do not respond to emails. Thank you for this post, it was the only way I was able to finally get help with my issue. This vacuum is definitely junk and the company is a sham! Agreed. It doesn’t clean and it doesn’t stay charged for more than 10 minutes. A broom is better than this!